06/02/14 in Sabian HHX Omni 22"
Sabian extends the Omni concept introduced on the AAX Series to the HHX range, with two new 19” and 22” cymbals. 08/31/12 in Sabian AAX V-Crash 20"
Sabian has recently rebranded its Vault Series as AAX, HHX, AA or HH, a move described as designed to simplify the company's cymbal line. 01/18/12 in Zildjian K Custom Dark Complex Ride 21"
Zildjian recently introduced new Custom Dark Complex Ride models. Supernatural introduces the Constellation Series of cymbals handcrafted in Turkey. Developers in the Sabian Vault were tasked with creating mixed-series sets, designed to appeal to drummers of varying skill levels. 04/06/11 in Paiste Twenty Custom Metal Hi-Hat 15"
Paiste has launched a new addition to its Twenty range, called the Twenty Custom Collection. The cymbals hand-manufactured in CuSn20 bronze with a glossy brilliant finish. Gen16, the new technology division of the Avedis Zildjian Company, has been awarded the "Best in Show" award at this year's winter NAMM Convention. 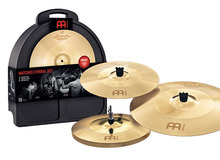 01/18/11 in Meinl Classics Custom Medium Hihat 14"
Meinl has also introduced a new series called Classics Custom. 01/18/11 in Zildjian Z3 Ultra Hammered China 19"
Zildjian presented the Zildjian Z3 Ultra Hammered Chinas and 22" A Zildjian Swish Knocker at NAMM 2011.